One of the most common cloud computing predictions is that hybrid cloud is the endgame for enterprise IT. In 2017, an emerging set of technologies will likely accelerate hybrid cloud adoption -- or at least simplify it from a management perspective. Oracle Cloud Machine, IBM Bluemix Local and the upcoming Microsoft Azure Stack are three examples of this new kind of cloud platform that allows organizations to deploy a public cloud-like environment within their own data center behind their firewall. In many cases, these on-premises systems behave almost identically to their public cloud counterpart; Oracle Cloud Machine, for example, runs the same software and features as the Oracle Cloud, and follows the same subscription-based pricing model. 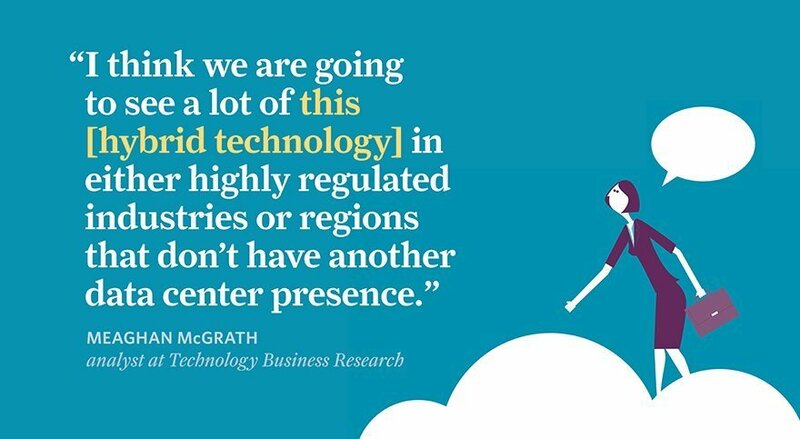 This consistency between the on-premises Oracle Cloud Machine -- hardware and software installed at a customer's own facility, but fully managed by Oracle -- and the Oracle public cloud helps ensure workload portability between the two environments, said Meaghan McGrath, an analyst at Technology Business Research in Hampton, N.H.
"[Oracle Cloud Machine] is the identical infrastructure as a service and platform as a service software as what runs in the Oracle public cloud," McGrath said. "So anything you develop in either place can be easily ported between the two." Azure Stack, when it launches next year, is expected to provide similar benefits, so users can treat their on-premises deployment as if it were another available data center or region within the Azure public cloud. On-premises cloud systems not only help facilitate hybrid cloud adoption, but could appeal to organizations with strict security or compliance requirements, said Jim O'Reilly, a cloud computing consultant and TechTarget contributor. "We could see this dedicated, single-tenant infrastructure within public cloud offerings as a business model, replacing in-house systems, that allay security and control concerns, while giving the benefits of rental and bundled management," O'Reilly said. These systems could also help cloud vendors increase their presence in areas such as Russia, where public cloud data centers might not exist. "I think we are going to see a lot of this in either highly regulated industries or regions that don't have another data center presence," McGrath said. What drives your enterprise toward a hybrid cloud model?